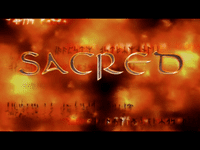 Sacred is an action RPG for the PC. The game is a high fantasy adventure on the continent of Ancaria, and has a similar feel to the Diablo series. - Seraphim: A holy warrior that emphasizes light magic. Depending on the character chosen, players will start in a particular region of Ancaria with a starting quest. They can explore the nation and accept quests from people they meet in the different towns and cities, or simply explore the outlands and defeat monsters. Unlike most action RPGs of the era, Sacred utilizes a cooldown period for spells rather than a mana pool. In addition, each character class has between 11 and 22 skills that can be unlocked. These skills can be used periodically, but only a certain number can be active at one time (limited by the number of skill slots). Skills can be improved by finding the relevant runes. Combo masters can string up to four skills into a single combo, allowing more skills to be used simultaneously.